I just wrote a journal article that compares and contrasts the style of two leaders from the early 20th century, H.G. Wells with John R. Mott. Their efforts demonstrate why visionary leadership involves challenging the process, inspiring vision and enabling others to act. Does global leadership still face an open moment in this post-Cold War period, as Harlan Cleveland asks? Will the 21st century fulfill its anticipatory promise, envisioned by thousands of new millennium celebrations from 1999 to 2000? Or has our world, since September 11th entered a black hole of civilization wars, energy shortfalls, failed peace plans, and killer storms? Is this New World Disorder destined to foreclose any sustainable trajectory for international security, trade, social justice or the natural environment? The answer to these questions might best be addressed by reflecting on the quality of our own leadership as it seeks to shape our worlds. Drawing upon Robert’s biographical research method, this paper will compare and contrast two influential leaders in the first half of the 20th century; H.G. Wells-the futurist and John R. Mott-the ecumenist. Following their introduction, this paper will define three behavioral leadership characteristics, gathered from Kouzes and Posner’s book on visionary leadership theory: challenging, inspiring, and enabling. Using these practices as yardsticks, Well’s and Mott’s leadership style will be compared and contrasted. This paper will conclude with insights on how Well’s and Mott’s visionary leadership could help non-governmental leaders today address the Global Problematique or Civilizational Crisis of the 21st century (Meadows et al; Slaughter). H.G. Wells (1866-1946) burst on the scene in 1895 as author of The Time Machine. This was quickly followed by a series of science fiction classics, including The Invisible Man, The War of the Worlds and The Island of Dr. Moreau. Through these and other social novels, such as A Modern Utopia, Wells awoke a complacent Victorian age to the enormous scale of change unleashed, through ideas such as Darwinian evolution, the Industrial revolution, and national ideology. Following World War I, in books such as The Open Conspiracy or The Shape of Things to Come, Wells turned from forecasting the crisis of western civilization to advocating for world reorganization beyond militarism. He educated a new workforce of adult learners through his trilogy of integrated knowledge, An Outline of History, The Science of Life,and The Work, Wealth and Happiness of Mankind. Wells eventually wrote over 110 books over the course of 50 years, concluding with his bleak farewell, Mind at the End of the Tether in 1945. While the public saw the novelist, journalist or mass educator, Wells thought of himself as a visionary leader offering science, socialism and world service to both youth and the intellectual advant garde who could bring forth an organic world state to replace a shell-shocked western civilization. John R. Mott (1865-1955) came of age in the YMCA student association in the 1880s and, by the year 1900, had formed the international associations of the Student Volunteer Movement for Foreign Mission (SVM) and the World Student Christian Federation. Within a decade Mott had convened the comprehensive Protestant “World Mission Conference” in Edinburgh based on the vision expressed in the book, The Evangelization of the World in this Generation. This led to the rise of the International Missionary Council, a coordinating body for Christian service around the world, the seedbed from which the World Council of Churches was formed in 1946 (Hogg). In that year Mott received a Nobel Peace Prize for his work in leading the young people of the world. In 1955 he died at the age of 90, still a Methodist layperson, yet recognized as the leading apostle of Christian unity during the 20th century (Hopkins). 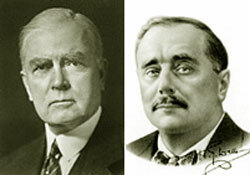 Both Wells and Mott were visionary world leaders. Both labored through non-governmental organizations. Both challenged personal complacency, hypocrisy and selfishness in the face of militarism, nationalism and industrialism. Both were contemporaries who called young people to world service. Yet there is no record they ever met or corresponded. This is despite common acquaintances with world leaders such as Teddy Roosevelt, Woodrow Wilson, Franklin Roosevelt or Winston Churchill. Mott labored within the industrial age framework and championed its enterprise, while Wells worked as a socialist on its periphery, to challenge what Wallerstein calls the modern “world system” of capitalism. Two decades after Wells and Mott’s death, each life was marked with publications to celebrate their birth centennials (Costa; Mackie). Despite these scholarly assessments of each leader’s work, no paper has examined these men from the vantage point of leadership studies as defined by Burns, Bass or Yukl. This study aims to fill this void, and contribute to the growing body of literature that examines civic or non-profit / NGO leadership, in contrast to government or business leadership. The method used to examine Wells and Mott is drawn from the biographical research method, while the comparative constructs are taken from visionary leadership. To study historical figures, Roberts claims the biographical research method offers context, depth and meaning. It allows the voice of subjects to be heard, and seeks to understand them in their context. Biographical descriptions and speeches of the leader are usually analyzed to identify behaviors, traits, critical incidents and influence processes. These in turn are evaluated against leadership characteristics. This study will draw its characteristics or constructs for comparison from visionary leadership theory. vision (idea) –> communication (word) –> empowerment (action). (e) Encouraging the Heart, the degree the leader gives positive feedback, publicly recognizes individual contributions and celebrates team achievements. These five characteristics correspond in content validity to Westley and Mintzberg’s visionary leadership process, defined by vision (idea), communication (word), and empowerment (action). In order to illuminate both the strengthens and weaknesses of visionary leadership as applied to 21st century futures, this biographical study will compare and contrast Wells and Mott according to the first three behavioral characteristics of Kouzes and Posner’s visionary leadership.